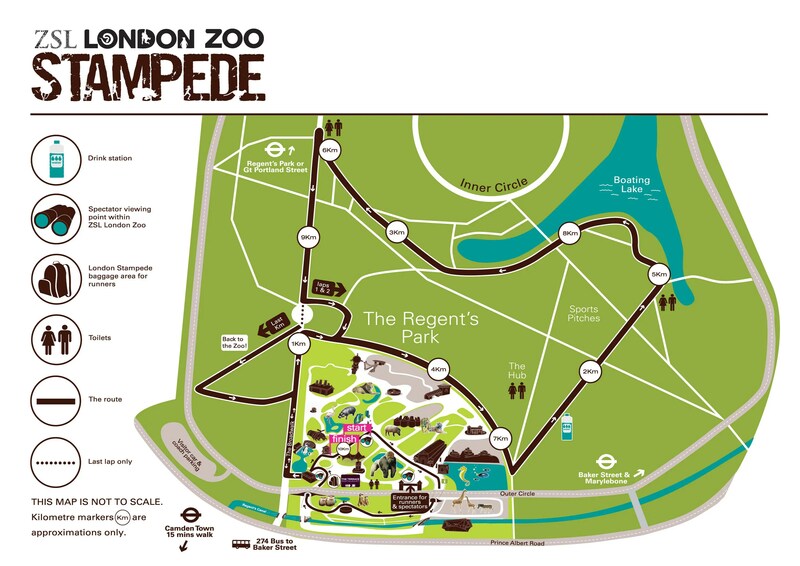 A few weeks ago I told you that I had entered the London Zoo Stampede which was a 10km run around London Zoo and Regents Park. This morning I completed said race. This in itself is exciting news as until I actually got to the bag drop I had no idea if this was going to happen. My train company, in its infinite wisdom, have decided that trains are a luxury early on a Sunday morning and so have replaced them with buses that take three times as long. To get to a Central London race with a 9.30 start time therefore means getting up at 5.30am. This combined with the reports of weather-doom for today in the British newspapers meant I really wasn’t sure if I could face getting up just to run past an elephant. Last night though the weather app on my phone was saying sun till 10am and The Boyfriend in an uncharacteristic fit of early morningness said he’d drop me at the station and so I decided to go. The Rail Company however wasn’t letting me off so easily – my 6.30am bus turned up at 6.50am. Result was I arrived at Stratford Underground station panicking at 8.04am. Bag drop was closing at 9.10am so I was cutting it a little bit fine as London Zoo is a 25 minute walk away from the nearest tube I could easily reach. However I’d got up too bloody early to not run though so I abandoned the bus and ran for the tube. Then utilised my emergency tenner and the great London black cab and arrived calm at 9am. The weather, as predicted by the app was dry with a bright blue sky and sun. I was in a little happy place. The Zoo themselves were brilliantly organised. The field was only 1000 runners but everything was clearly marked, they had marshalls everywhere making sure you ended up in the Portaloo not the lion enclosure, said Portaloo had no queue (as everyone was using the flushies**) and the start line up was arranged by time which reduced a lot of bottle necking at the start. The only thing I wasn’t sure about was the chip design. It was a flat chip that you had to put under your laces and then bend upwards and fix in a loop. It didn’t feel secure at all and I spent a lot of time checking it was still there. 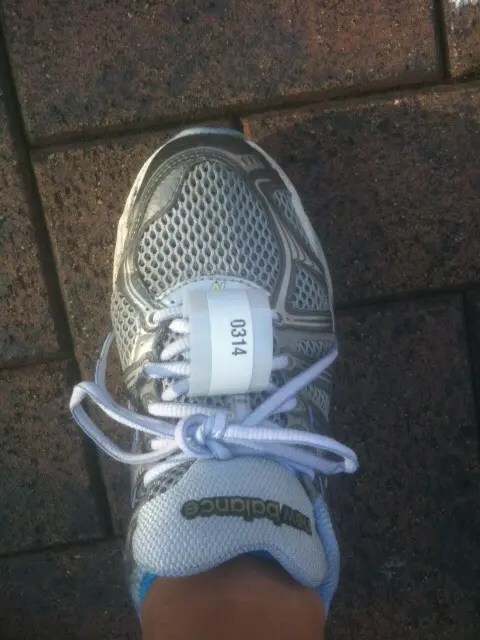 Considering minutes into the race I’d already run past two chips who’d parted company with their owners this didn’t seem overly paranoid after all. We set off to a recording of a cockerel crowing (???) and started to run the zoo. Admittedly this didn’t take long – and didn’t go past that many exciting animals which was a bit disappointing. Maybe I’ve been spoilt by the Disney courses but I was expecting to at least go past something big like an elephant or a giraffe, all I managed to see in the zoo itself was a muddy pig, and cute as he was, I kind of wanted a bit more fluff, fur or feather with my scenery. Still, hunting for the above at least passed the first 8 minutes, then we were out of the zoo and into Regents Park where, from the footpath you got a glimpse of some camels. The course was pretty narrow and for the first 3km it was congested and even with the paced start there was a lot of weaving around slower runners – and, a lot of faster people weaving around me. Plus, the park is open to other users so you’d also get the odd dog walker refusing to deviate from their normal morning path – even with a few hundred runners coming rapidly toward them (I suppose you have to admire their grit). The course itself is three laps of the park, the first time it’s pretty, the second time the only excitement is seeing if the camel has moved, the third time you’ve had enough. I also think if you were a fast runner (sub 5 minute km) you’d get a bit frustrated as you’d have to pass a lot of runners and walkers on your final lap. My main aim was to find Tammy the Anteater (see here) but sadly Tammy was asleep in her indoor cage. 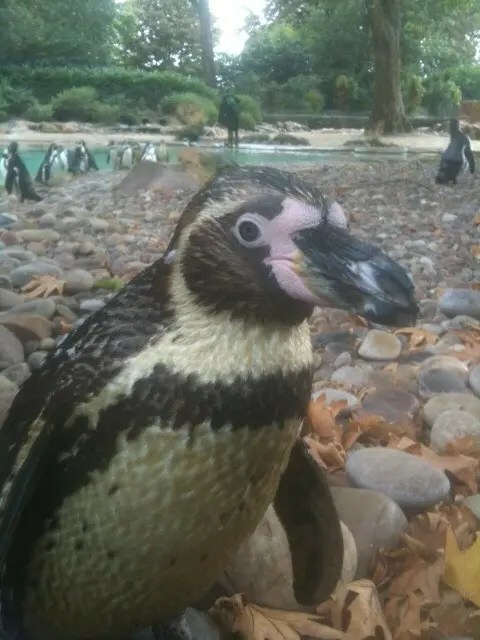 I did however spend a very happy ten minutes nose to beak with an inquisitive penguin. By the time we’d discussed the finer points of fish dining, the wind was kicking up, rain clouds were building and I still had a 25 minute walk back to the tube and so I decided to say goodbye to my furred, featured and finned friends and head home. I’m glad I did the race. It wasn’t the most exciting course, and I would have liked it to be started by Tammy waving a little flag or an eagle swoop-by or something but it made a nice change. And money raised by entry fees and sponsorship go to the zoo so you can feel as if you did some good. If I lived in London I’d probably run it again, although I’m not sure I’d travel for 3 hours again to run it – unless they did start it with Tammy waving a little flag of course. I had never heard the term flushies until I ran last week with my buddies from the WISH team. In case you haven’t worked it out it means the proper toilets that aren’t dark, that you can usually breathe in – and that flush without cranking a scary handle. Even now it makes me laugh.